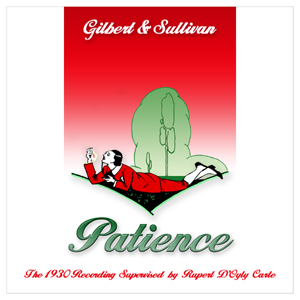 This recording was the last of three HMV Gilbert & Sullivan sets issued in the busy year of 1930— Iolanthe and Pinafore being the other two. It features important historical singers in nearly all the roles and is a vital document of one of D'Oyly Carte's best periods. Alas, in this set we didn't get to hear Henry Lytton's Bunthorne. His voice wasn't considered suitable for the gramophone, and he was replace (as he often was in these settings) by George Baker. Patience came after The Pirates of Penzance, four years before The Mikado; and when its long run was at its height people used to wonder whether a piece that caricatured a passing craze could possibly out-live the so-called æsthetic movement which it helped to kill. With what success it has done so there is no need to tell. The laughter that greets its amusing quips at every revival is as loud as the applause awakened by the wonderful music whose interest can never fade. Small wonder, then, that H.M.V. 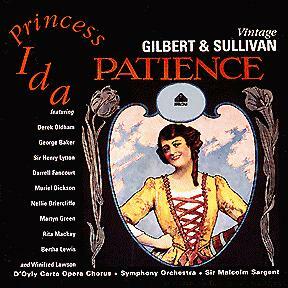 has seen the advisability of re-recording the complete opera, to replace the Album which was made before the electrical process came in, with Violet Essex, Edna Thornton, Nellie Walker, F. Ranalow, George Baker, and Peter Dawson for principal singers. It may be doubted whether the new cast will he considered quite as strong, part for part; but as an ensemble it is even better, because it has brought to its work the authority and constant co-operation of the sempiternal D'Oyly Carte Company, under the experienced guidance of Dr. Malcolm Sargent; and that, of course, is a combination not to be beaten by the finest "scratch" team ever put together. Here is the distribution: Col. Calverley, Darrell Fancourt; Major Murgatroyd, Martin Green; Lieut. the Duke of Dunstable, Derek Oldham; Reginald Bunthorne, George Baker; Archibald Grosvenor, Leslie Rands; Lady Angela, Nellie Briercliffe; Lady Saphir, Marjorie Eyre; Lady Ella, Rita Mackay; Lady Jane, Bertha Lewis; Patience, Winifred Lawson. The Album consists of ten 12-inch records, numbered D1909 to D1918. It may go without saying that the technique of the recording shows an incomparable advance upon that of the ten-year-old series that preceded it. The delicacy and refinement of the instrumentation stand clearly forth all through, together, I am glad to say, with a precision of execution and accuracy of tempi that the careful François Cellier would assuredly have approved. 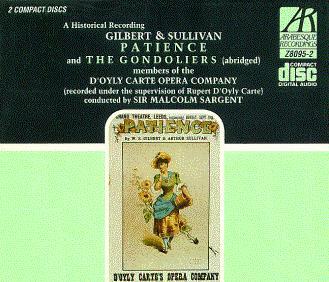 Another welcome feature is the quality of the choral tone, alike in girls and men; for I can fairly say that it is quite up to the best Savoy standard, new as well as old. Neither is rhythm or spirit lacking, while the words of the "twenty love-sick maidens" impinge upon the ear as incisively as those of the "heavy dragoons." Of the principals, Mr. Baker and Miss Lewis strike me as carrying on the true traditions most faithfully. It is better under these conditions to listen to a Reginald Bunthorne, who can sing as well as he acts, than merely to have a good comedian in the part of the "fleshly poet." If, as a gramophile, I had to choose between the late George Grossmith, Sir Henry Lytton, and Mr. George Baker, I would not hesitate to take the last-named. He is an accomplished vocalist, and knows how to sing his music, besides lending it the necessary character and touches of humour. His patter is superb because, no matter what the speed, every syllable comes out as clear and neat as if he were talking. This, too, is where he surpasses that clever artist, Mr. Darrell Fancourt, whose method is too explosive for microphonic purposes, and he is consequently indistinct. On the other hand, Miss Bertha Lewis, with her imperturbable sostenuto and pellucid enunciation, offers a model that the whole company might profit by imitating in the more sedate passages of the opera. 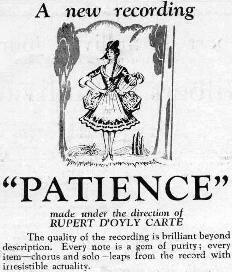 To some extent Miss Briercliffe seems to achieve this; but the tones of Miss Lawson's thin soprano voice only grow more acidulated as time goes on, and her recording timbre, which may recommend itself to some judges on account of its penetrating quality, sounds to my ears so pinched as to be at times positively unpleasant. In the theatre it is certainly less so, thus proving that a singer of this type has little reason to be grateful to the amplifier. On the whole, however, it must be allowed that the last-named, whether instrument or individual, has obtruded only to an infinitesimal degree in the making of this admirable version of Patience. The schedule of sessions for this recording is relatively straightforward. 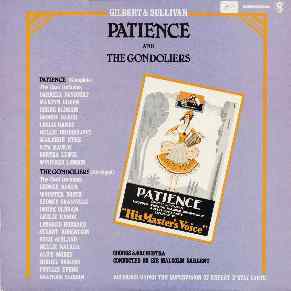 The opera was recorded on four dates across a two-week span in Sept–Oct 1930, with just two sides requiring retakes at later sessions. The first or second take was published for all but three sides, and it is curious that two of those three were Winifred Lawson's solos.